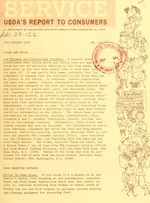 Issued Nov. 1963-Feb. 1973 by the Department's Office of Information; Mar. 1973-Dec. 1977 by the Office of Communication. And Thiamin And Protein And Vitamins. A nursery rhym k .
established what little girls and little boys are made% . which may not be nutrition labeling in the true sense, ..
are made of. It was partly this human curiosity that led "
Visual Center, GSA, Washington, D.C. 20409.
and fishing equipment for procuring food. -- shrinkage, flammabilitvQ Ind instructions on how to care for the garment. U.S. Depaftme'. of Agrirc4' f re, Washington, D.C. 20250. Photo Lab, Inc., 3825 Georgia Avenue N.W., Washington, D.C. 20011.
education programs. The. one-page, illustrated sheets can be used as "camera copy"
for offset reproduction. Copies of "How To Buy Bacon," "How To Buy Sweetpotatoes,"
cultural Marketing Service, U.S. Department of Agriculture, Washington, D.C.
school's food has stimulated more student interest in meals that are served. consumer educators, provides consumers with information on egg grades and sizes. cultural Marketing Service, is the story of modern egg production and marketing. Service, Office of Communication, U.S. Department of Agriculture, Washington, D.C.
in wild and cultivated forms in several temperate and tropical areas of the world. elers' Tips" could save you unnecessary delay and possibly money on your return. Free copies of the new booklet may be obtained by writing "Travelers' Tips," U.S.
Department of Agriculture, Washington, D.C. 20250.
cery store, have you thought, "I could make it from scratch for half the price"? part to more efficient use by the processors of meat from a carcass. Lillie Vincent, Editor of SERVICE, Office of Communication, U.S.